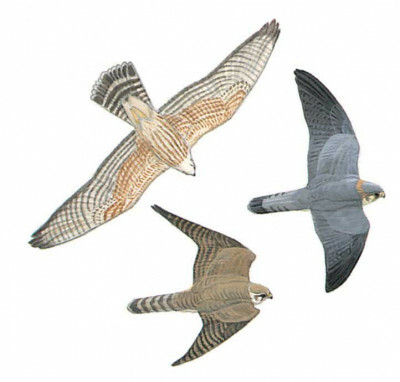 Smallest falcon in the region; has short pointed wings and relatively long tail, speedy flight with fast wing-beats, interspersed with short quick glides. Male told by blue-grey upperparts with blackish primaries, broad black tail-band and ill-defined head pattern. Female and juvenile are brownish above, creamy below with dark streaks, diffuse moustache, barred primaries above and five pale/dark bands of equal width on uppertail. Hunts usually low over ground, attacking with thrush-like undulating flight, changing direction, followed by a straight attack. When perched, wings fall clearly short of tip of tail.